When Jesus Christ comes into your life, He changes you. Maybe you have a problem with drugs or alcohol. Maybe you struggle with lust, fear, doubt, or self-pity. Maybe you're a slave to public opinion or perfectionism. 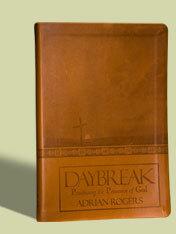 But I want to tell you that the Jesus Christ who set Adrian Rogers free is the Jesus Christ who will set you free. However, our freedom in Jesus Christ isn't the privilege to do what we want. Instead it is the glorious, abundant, supernatural power to do what we ought. It is saving grace that sets us free. It is sustaining grace that keeps us free. Bow before the Lord and thank Him for the freedom you've been given through the great price of Calvary.